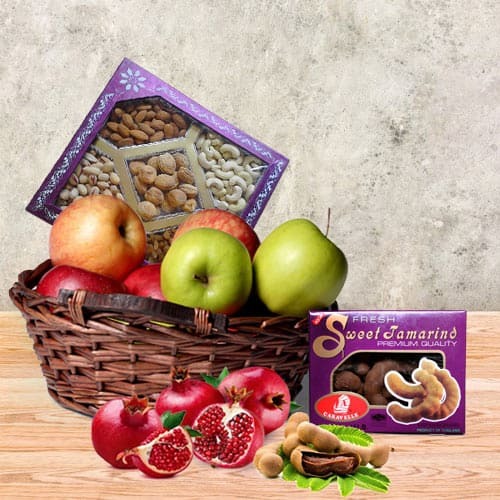 Send this delightful gift of Sophisticated Take Your Pick Assortments Gift Basket with unlimited love and best wishes. Our beautifully designed holiday celebrations Basket is the perfect gift for anyone as it holds 250 gm. of Walnut, 250 gm. of Pistachio, 250 gm. of Raisins., 250 gm. of Almond, Sweet Tamarind, 250 gm. of Cashew, 1/2 kg. of Red Apple, 1/2 kg. of Green Apple, 1 kg. of Pomegranate and 1/2 kg. of Pears.